July 27, 2018, Taipei, Taiwan – BIOSTAR debuts two mATX motherboards for the 1st and 2nd generation AMD AM4 Ryzen processors with the BIOSTAR B450MHC and BIOSTAR B450MH. 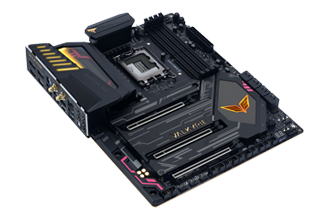 Both BIOSTAR B450 motherboards include features found in higher-end motherboards to take full advantage of the 2nd Gen Ryzen processors. 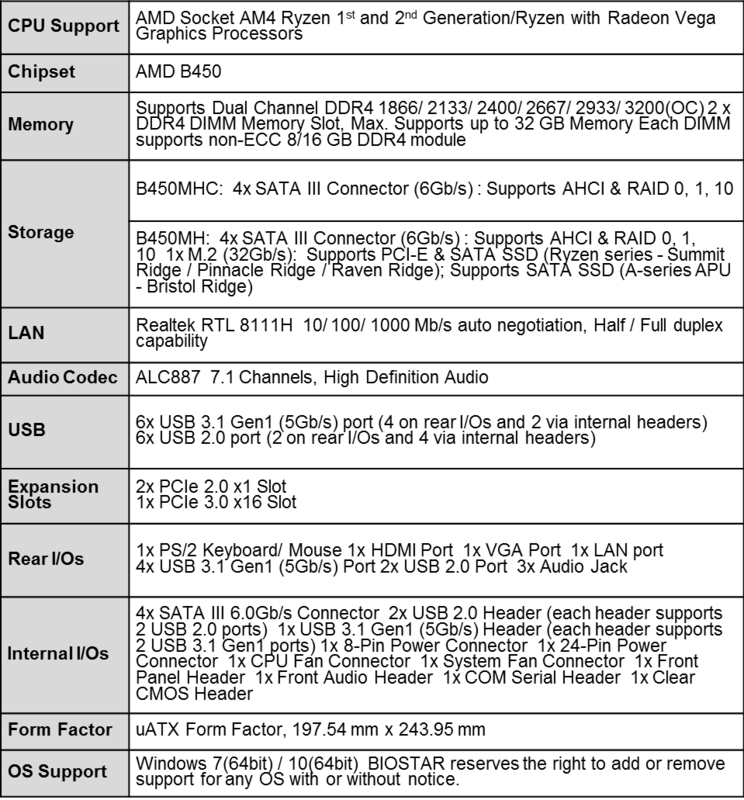 The BIOSTAR B450MHC and BIOSTAR B450MH support DDR4-1866/ 2133/ 2400/ 2667/ 2933/ 3200(OC), 1x PCIe 3.0 x16 slot, 2x PCIe 2.0 slots, 4x SATA III connectors, 1 x M.2 (B450MH only), 6x USB 3.1 Gen1 (5Gb/s) ports (4 on rear I/Os and 2 via internal headers) 6x USB 2.0 ports (2 on rear I/Os and 4 via internal headers) and more. The BIOSTAR B450MHC and BIOSTAR B450MH are built with higher-end features to keep up with gamer demands. The B450 chipset gives gamers the option to overclock the CPU to take full advantage of the full graphic settings (not usually found in mid-range motherboards). The chipset has an efficient idle power to draw less than 2W, saving power and reducing heat when not in use. The B450 also has enhanced VRM and memory routing specifications, a featured originally introduced with the X470 design. BIO-Flasher - update BIOS effortlessly from a USB flash drive before entering the OS. eHot-Line Utility – an integrated e-service automatically sends technical support requests to Biostar’s tech support team. The BIOSTAR B450MHC and B450MH rear I/O ports includes: 1x PS/2 keyboard/mouse, 1x HDMI, 1x VGA, 1x Realtek RTL 8111H GbE LAN port, 4x USB 3.1 Gen1 (5Gb/s) ports, 2x USB 2.0 ports and 3 x Audio Connectors. 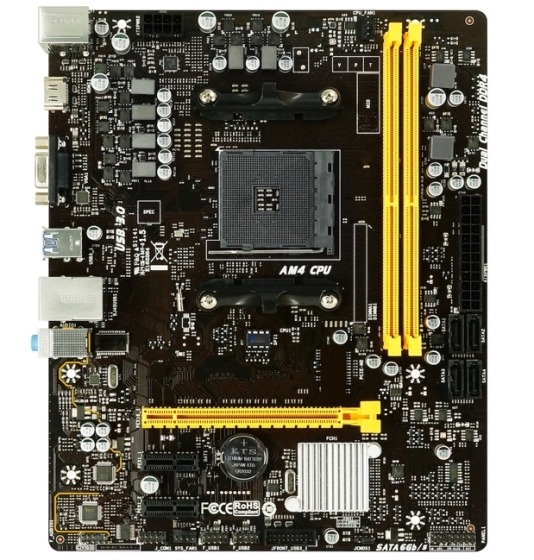 The BIOSTAR B450MHC and B450MH are the latest AMD AM4 Ryzen 2 compatible motherboards for mainstream gamers looking to boost their gaming performance at an affordable price.